This is the main index for the Satapatha Brahmana translation. 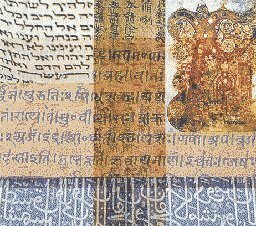 The Satapatha Brahmana is a Hindu sacred text which describes details of Vedic rituals, including philosophical and mythological background. It was committed to writing about 300 B.C.E., although it contains portions which are far older, transmitted orally from unknown antiquity. Specifically, there are references throughout to a primal mother-Earth worship, unnamed snake deities and human sacrifice. There are also recitations of key Vedic-era myths, including the flood of Manu and an extended Creation myth which includes the 'cosmic egg' motif (see, e.g., the Finnish Kalevala). Of course, this is a very ancient text which bears the same relationship to current Hindu beliefs and practice as ancient Mediterranean mystery religions do to modern Christianity. That said, the Satapatha Brahmana is a gold-mine for scholars of mythology and comparative religion, and this is the only available complete translation. Books V, VI, and VII. Books VIII, IX, and X. Books XI, XII, XIII and XIV.